Whenever new governmental policies affect investments, investors can normally adapt to the situation. Normally, these policies will steer the industry in a certain direction that can be rather predictable. It is much more difficult, though, when governmental policy goes in opposing directions. Based on current legislative proposals, it appears that the federal government wants to go in one direction while Alaskans want to go in the other. Let’s look at what’s going on with these two opposing proposals and what it could mean for investors in the energy industry. The most recent budget proposal from the Obama administration can be viewed through several lenses, but the overlying theme is to foster greater alternative energy growth and increase governmental revenue from fossil fuels. Whether you agree with this policy or not, it’s clear that energy is one of the focal points of the budget, with the Department of Energy receiving an 8% increase in spending in the face of several departments seeing budget cuts. If the proposed budget were to move forward as is — a highly unlikely situation — several tax incentives for exploration and production will expire, a proposal that would equate to about $3.9 billion a year spread across the entire industry. It would also set up an Energy Security Trust fund by increasing royalties from oil produced on federal lands and waters. This increase would total about $250 million a year for the next decade. As expected, several fossil fuel advocacy groups such as the American Petroleum Institute and the Independent Petroleum Association of America have come out vehemently against these proposals and claim that these proposals will reduce exploration. It’s difficult to know exactly what will happen to the oil and gas industry if these policies were implemented, and there are several other factors that need to be considered as well. America has pulled so far ahead of other countries in drilling technology, it may take decades before everyone else catches up. Also keep in mind that energy capital expenditures for 2013 are expected to be 7% greater than last year and are approaching all-time highs. So while these kinds of moves would take some wind out of the energy space’s sails, it will take a lot more to leave them dead in the water. 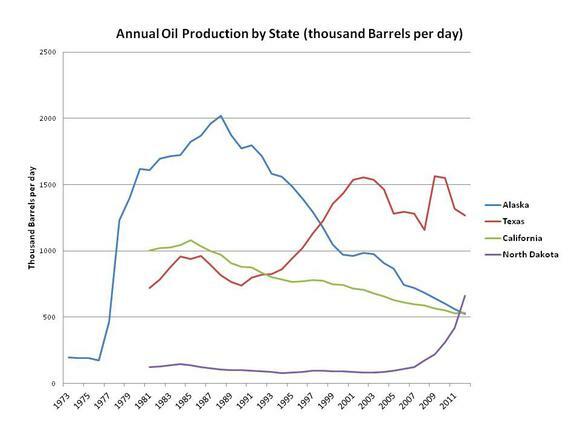 For many years, Alaska held the title of largest oil-producing state in the United States. But ever since its peak in the late 1980s, production has been on a steady decline. Also, with shale gas becoming easier and easier to access, Alaska has now fallen to No. 4 in terms of total production. Sources: US Energy Information Administration, author’s calculations. With so much of the state’s economy tied to the success of the oil industry, Alaskan legislators are worried that the current tax structure has stymied production growth in the state. So this week, the state legislature has agreed on a massive tax overhaul that will save the industry $750 million a year in taxes. The hope is that lower taxes will drive reinvestment into North Slope and Alaskan offshore drilling. Exxon Mobil Corporation (XOM), Chevron Corporation (CVX): Big Oil Future Like... Goldcorp Inc. (USA) (GG), Yamana Gold Inc. (USA) (AUY) and Three Stocks Near... Oil News: Exxon Mobil Corporation (XOM), BP plc (ADR) (BP), Schlumberger Limited... Barrick Gold Corporation (USA) (ABX), Freeport-McMoRan Copper & Gold Inc... Chevron Corporation (CVX): Royal Dutch Shell plc (ADR) (RDS.A) Wins, the World... Should You Avoid Eni SpA (ADR) (E)?